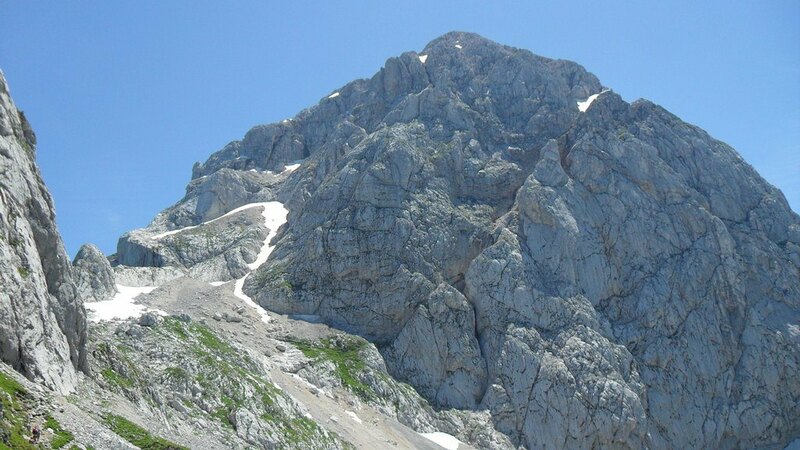 Mangart, 2678 m, is a mountain on the border between Italy and Slovenia. 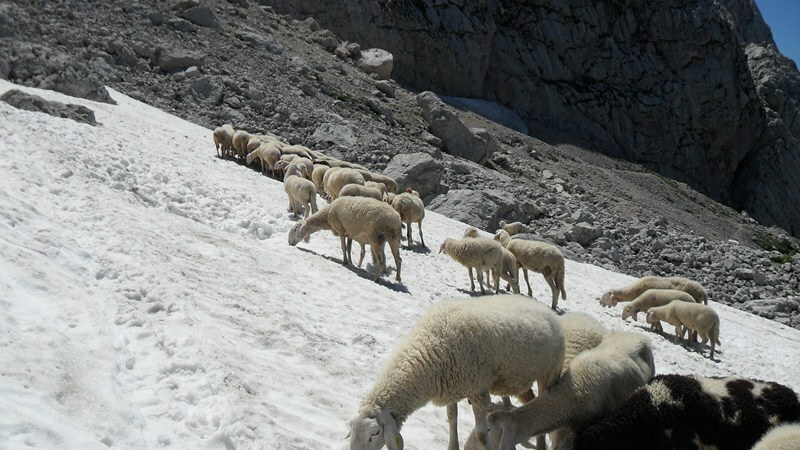 There are many routes to the summit, from both countries. 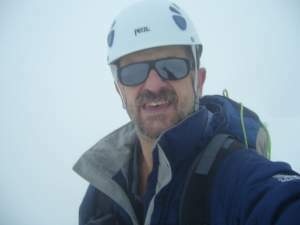 Within this post, I describe the normal route from Mangart saddle (2055 m). Mangart as seen from the Mangart saddle. The mountain is most easily climbed from Mangart saddle, which is accessible by car, and it is at the end of the attractive Mangart road, see the map below. Note that the Mangart road is an attraction for itself, just see the link given here to realize this. There is an entrance fee for the Mangart road. When I was there in 2010, it was 5 E. You will pay it at some point after you start driving up the Mangart road. Mangart saddle and the end of the Mangart road. Jof di Montasio in the distance far behind. 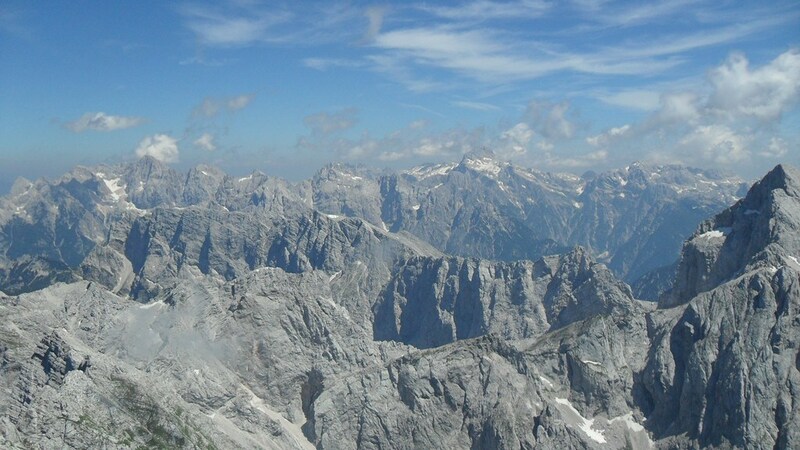 View of Jalovec, Triglav in the distance far on the left. There exist two normal routes and both start from the Mangart saddle. 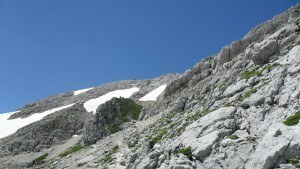 They approach the summit from both Slovenian and Italian side. You will need no more than two hours to arrive at the summit. Many other routes, from both countries, are very hard ferratas. They are not for inexperienced people and they require proper ferrata equipment. One mountain hut is on the Slovenian side very close to the saddle, at the altitude of 1906 m. There is also Bivouac Nogara on the north Italian side at 1850 m.
Breathtaking view of Slovenian Alps. Climbers in the north wall, look more closely. 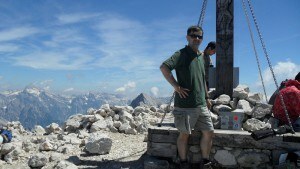 I climbed Mangart in July 2010 from the Mangart saddle. This was a quick tour for me. I was attending some activity at the International Center for Physics in Trieste. 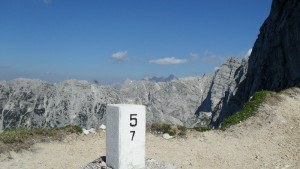 We had a free weekend, so on Saturday morning I hit the road and arrived at the saddle at 12:30.The Slovenian route was for some reasons closed; this is partly a ferrata route and I guess some sections of it were not in a good state, so I followed the Italian route. I was at the summit at 14. All the Italian normal route is just a simple walk-up. There were a couple of places with a bit of snow but those were simple. The magnificent pyramid of Jalovec was most of the time in the sight. Slovenian Alps are lower compared with those in Austria and Italy, but I believe that with their beauty they surpass anything you may see in the Alps. I hope the photos given here are able to depict this. I spent the night on the saddle itself. This was yet another great experience, staying in nature and so close to all the beauty around. You may imagine how it was, cooking some meal on the grass and watching the sunset, later stars appearing from the sky, long night to follow, and no sounds whatsoever. Early next morning I rushed toward Jof di Montasio which I climbed that same day. The story about this climb you may see here within the site. Late in the afternoon after that climb, I was on my way back to Trieste. On the whole, this was one of the best weekends ever. To conclude, from the text you have realized that the Italian normal route to Mangart is not difficult, and it does not require any specific equipment. The Slovenian route I did not pass. Hopefully, some readers might give a few details in the comment box, and I also give here a YouTube video of this Slovenian route. You might want to check also my text on climbing Jalovec. Please leave your comments below, I shall be happy to read them and to give answers to any questions. Thank you for showing us the Mangart. We are a couple who would live to climb it, but level of experience is not that great. I noticed you mentioned that the Italian route is easier, but is it – beginner – easy? Where exactly to we acces the Italian route, because I can’t find any clear directions there. Hi Oliver, great to hear from you. Mangart is a mountain with so many faces and a variety of routes. The route I described in the text is indeed very easy in technical terms, just a walk up. So yes, even if you do not have experience I am convinced you can do it without problems. Regarding you question about the route, see the map in the text and then see the photo below it. They show the same. You see the road and a tiny route to the right, this is your direction. So again, when you are at the Mangart Saddle go towards the summit, the direction is obvious because there is no other direction. At one point, very soon, the route splits, one goes clockwise around the massif (this is the Italian route), the other goes to the right anti-clockwise around the summit (this is the Slovenian route). So take the first one. I’ve decided to write a reply, because I passed both routes few days ago. 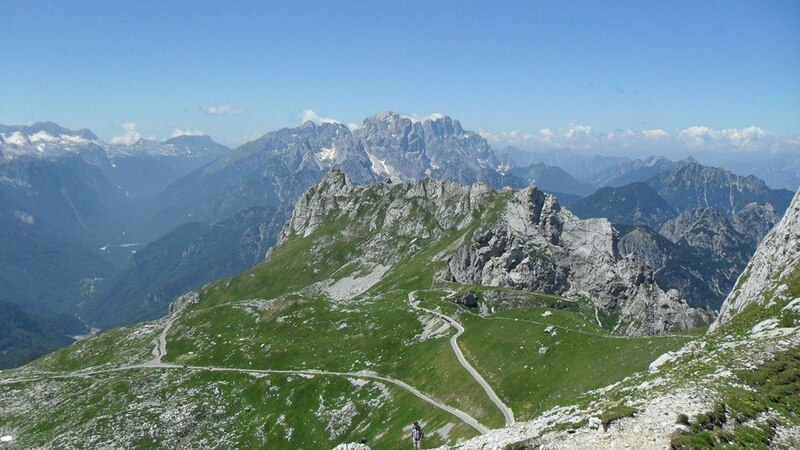 The Slovenian route up and Italian route down (start and finish on the saddle). 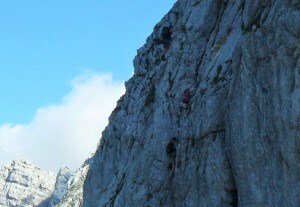 Although not difficult, the Slovenian route is much harder and exposed. People with no basic experiences in ferratas should not go alone on this route. Self-protection equipment is strongly recomended. Because of the road many people treat this mountain as easy walk. But may injure themselfs or even die. I am not trying to scare nobody. Just be careful and honest about your abilities. Many thanks Bostjan, great to read your comment. Clearly it adds extra information and I am grateful for this. is thorough in my opinion. The experience shows because it offers information about multiple mountain ranges. Their altitudes and coordinates are included for people who are adventurous. A person could choose to climb one mountain or climb all the mountains that are highlighted. Thank you Gerald, great to read your comment. I am happy that you like my text. Wow…. mountain climbing has always been one of those things that terrifies me, but I totally admire those who get so much joy out of it. The photos on your post are amazing, I can understand why people get such a rush. Thank you Jyl for reading my text and for the time to write this comment. Perhaps this might give you some idea to try yourself, you know to face the thing that terrifies you, this is the way to overcome the fear. Thank you again. This sounds like a great way to spend a weekend! Your pictures are stunning and it looks like you were very fortunate with the weather. What were the temperatures during the day and night? I climbed Mount Kilimanjaro many years ago and always planned to do more in the future. This sounds like a very accessible climb and a good place to get started again. Hi Matthew, thank you for the comment. I dream about going to Kilimanjaro. Mangart is far from such heights and very accessible along the normal route. As for the temperature, quite comfortable. I have been spending nights at much higher altitudes. You simply make mountain climbing look so easy and enjoyable. I have never tried this type of climbing activity before but time and time again, as i do read more and more of your posts and articles, i am forced to want to try out this mountain climbing stuff. Hi Fidel, thank you for the comment. 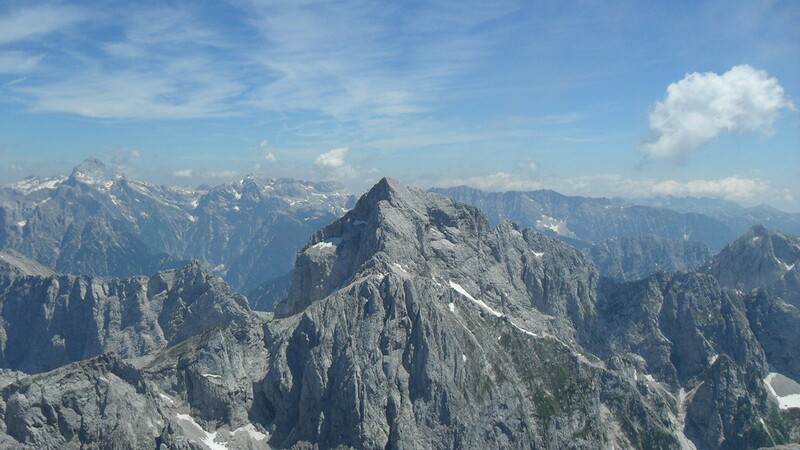 In fact this particular mountain is not difficult, high car access makes the normal route easy. But there are hard routes, see some other on my site, like this about Weismiess, or this about Breithorn at Simplon. Your website is an eye-opener for anyone who walked on simple mountain trails. I love hiking where I live in south of Qc, Canada. I sometimes find it hard to breath even though it’s 1 hour climb! I can only imagine what it would be to make 3 or 4 hour long hiking in these steep slopes you are showing in the beautiful pictures you provided! Also I wonder what is a ferrata and is there some instructions when you’re onsite and ready to pick a trail to ensure one doesn’t choose an expert level trail one (when you are not experienced)? Hi Carolyn, thank you for kind words and for visiting my site. 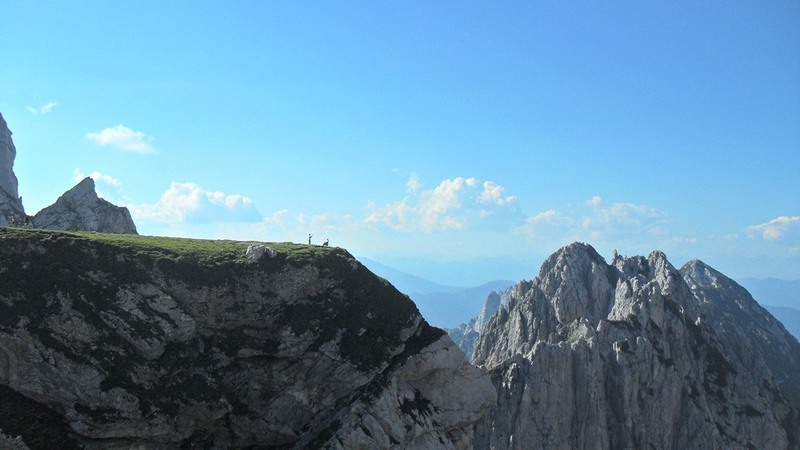 Regarding ferrata, this is Italian term accepted in Alpine climbing and it means following routes that are generally hard and made accessible by fixed iron cables. To go there you would need a harness and y-rope with carabiners, you may see more in my page about equipment. You may see a typical ferrata climb in my page on Zugspitze, the highest German mountain. It is absolutely essential to do some homework before setting of, to avoid unpleasant situations. You must know what kind of route it is. The one described here on Mangart page is ordinary mountaineering route and you do not need extra equipment. Thank you again. Such a beautiful part of the world! We spent a week last year in this area and it was fantastic – although our visit was nowhere near as energetic! lots of leisurely walks and swimming pools 😉 I do remember however, that some of the narrow roads were more than a little scary to drive! I note you say that the climb isn’t too difficult, but would it be suitable for some energetic children to climb too? This looks like something that they would most certainly enjoy. Hi Boyo, thank you for the comment. This particular route is not so hard and you do not need special equipment. Access road is high which makes it rather easy. I am sure children above 12 could do it and they would enjoy it. My name is Marant, from the US ! I operate a site called where I write about work boots, hunting boots and hiking boots. From time to time I get questions from people about serious mountaineering. I would love to be able to refer them to your site to get the information they seek! 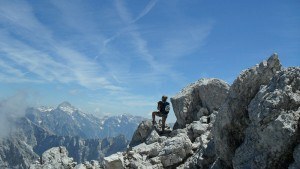 How long have you been involved in mountaineering? Whats the highest summit you have ascended? You have written some wonderful articles and your images are outstanding! Hi Marant, thank you for the comment and for the offer. Surely you can refer to my site, I appreciate this. I have been above 4000 meters a number of times and climbed many mountains in the Alps, but also in Japan and Tenerife mountains. Man I’m going to be honest with you. Considering your extensive knowledge of mountain ranges, you should add a travel component to your website that also talks about restaurants, famous sites, and good places to stay. I’ve been to Italy several times, but mainly in Southern Italy, but I took a train from Switzerland down to Rome and Northern Italy was absolutely breathtaking. Would love to go there again on a hiking/mountain climbing excursion! Hi Zeno81, great to read your comment. I am trying to write about mountains as this is what I love. I do provide some information about accommodation as well. And there are some banners on every page. This was a very interesting post, and I absolutely love the pictures! I have always wanted to get more into mountain hiking, but it is hard for me living in the central United States. I hope to someday get the opportunity to travel and be able to view this type of scenery with my own eyes! Great work, and very interesting! I pinned it also. Hi Allan, thank you for visiting my site and for the comment. Indeed you are across the world, but who knows perhaps someday you might find yourself in the Alps, so bear Mangart in mind, you will enjoy it.